On the Town (1949) is one of the 1001 classic movies you should see. 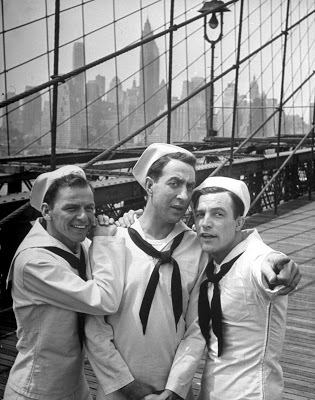 The musical stars Frank Sinatra (left), Jules Munshin, and Gene Kelly as three sailors who are on shore leave in New York City. Each week, I'm going to recommend a classic movie you should see (for the reasons behind the 1001 series and reviews of earlier films covered go here). Every August TCM airs its Summer Under the Stars film festival, which features 24 hours of movies from a different old Hollywood actor for 31 days. This month, I'll be covering one movie from each Saturday's honoree; Aug. 5 is Gene Kelly day, so I'm writing about the groundbreaking musical, On the Town (1949), which is airing at 12:30 a.m. Another Kelly movie I covered in this series is Singin' in the Rain (1952), which is airing at 8 p.m.
On the Town tells the story of three sailors, Gabey (Kelly), Chip (Frank Sinatra), and Ozzie (Jules Munshin), who have 24 hours of shore leave in New York City. The friends are determined to see all of the tourist attractions the Big Apple has to offer, but they soon run into three ladies who have very different ideas. Chip is romanced by a brassy cabbie (Betty Garrett), an amorous anthropologist (Ann Miller) can't keep her hands off of Ozzie, and Gabey becomes enamored of a struggling dancer (Vera-Ellen), whom he thinks is a big-time star. On the Town is based on a landmark Broadway musical that MGM producer Arthur Freed acquired for his famed production unit. 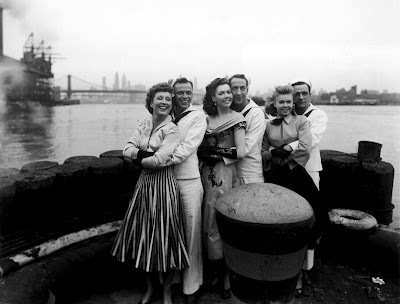 The 1945 musical Anchors Aweigh, which teamed Kelly and Sinatra as two sailors in love with the same woman (Kathryn Grayson), was a big hit, and Freed was looking for material for a follow-up. Freed plunked down $250,000 before the show even opened for a joyous film version that was co-directed by Kelly and Stanley Donen and was filmed partially on location in New York City. The result was a big box-office hit that remains one of the best MGM musicals of the 1940s. 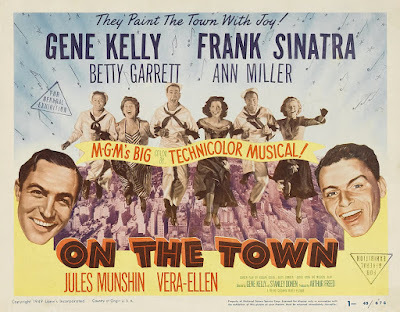 On the Town came at a pivotal time in Kelly's career. The former dance instructor from Pittsburgh had achieved stardom by appearing next to MGM's top leading ladies like Judy Garland and Lana Turner, but he and director Vincente Minnelli's attempts to take the old Hollywood musical in a new direction with The Pirate (1948) largely fizzled. Kelly, working closely with choreographer-turned-director Donen, got a second chance with On the Town. This time, Kelly's vision of storytelling through dance and music worked perfectly and led to his great successes in An American in Paris (1951) and Singin' in the Rain. 1. Location shooting. During the 1940s, most old Hollywood films were shot on the studio backlot, but Kelly and Donen successfully lobbied MGM brass for nine days of location shooting in New York City. The location shooting gives On the Town an energy and immediacy, especially in the "New York, New York" number (watch for the large crowds of (mostly Sinatra) fans gathered in the background to watch these shots). 2. Play vs. movie. The Broadway musical version and the film version of On the Town are vastly different. First, little of Leonard Bernstein's landmark score remains other than "New York, New York," "I Feel Like I'm Not Out of Bed Yet" and "Come Up to My Place;" the other songs were written by Roger Edens, Adolph Green, and Betty Comden (Bernstein did write two musical ballet sequences for the film). Also, the censors required extensive changes to both the dialogue and the song lyrics. Most famously, the line "it's a helluva town" from "New York, New York" was changed to "it's a wonderful town." 3. Gender roles.The relationship between Kelly and Vera-Ellen's characters is conventional, but the other two relationships are not. Both Garrett and Miller's characters are independent career women who are the pursuers in their relationships. While this is mostly played for comic effect -- for example, Miller is enamored of Munshin because he looks like a "prehistoric man" -- it is still quite groundbreaking in depicting how World War II changed gender norms in American society. 4.Ballet sequences. Musical numbers that told a story through dance were de rigueur in fifties musicals (see: An American Paris, The Band Wagon (1953), and Singin' in the Rain). 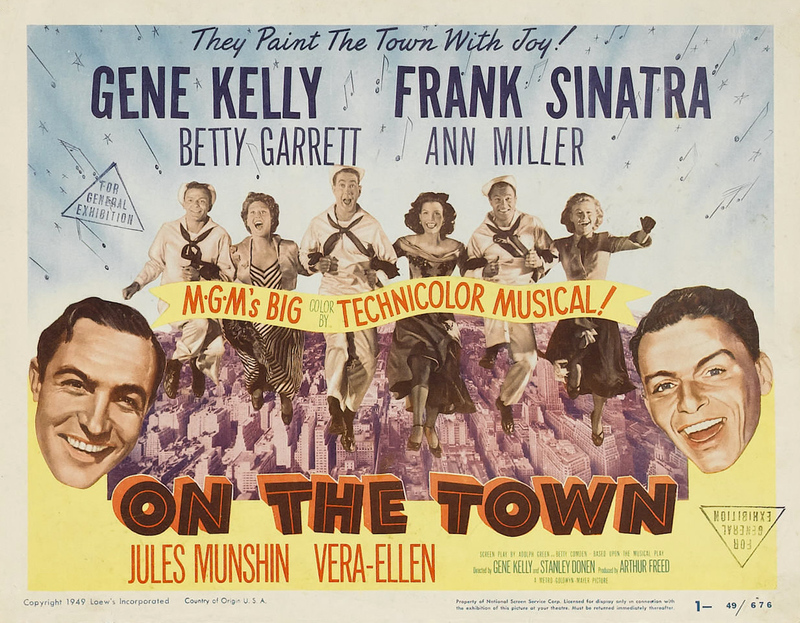 On the Town was the first old Hollywood film to take up a trend that had started with the Broadway musical Oklahoma! and continued with the British film, The Red Shoes (1948). 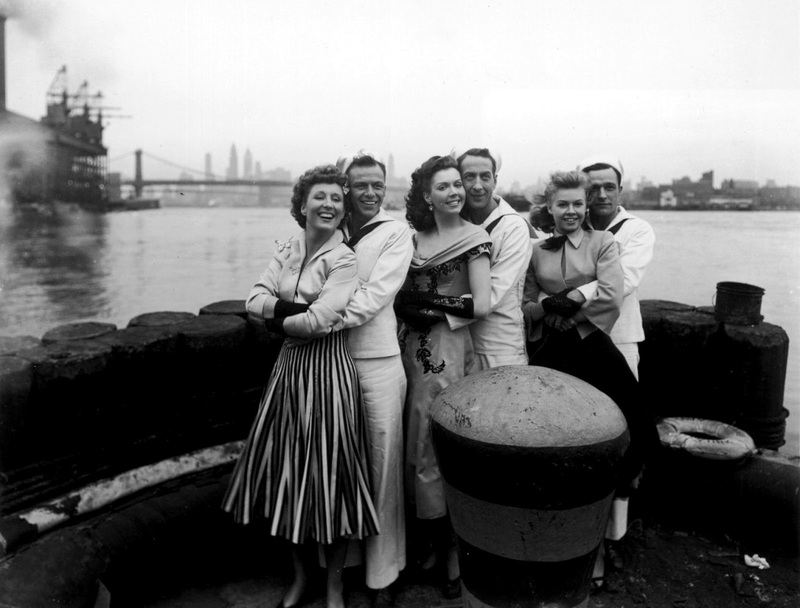 The cast of On the Town (1949): From left, Betty Garrett; Frank Sinatra; Ann Miller; Jules Munshin; Vera-Ellen, and Gene Kelly. Other critics: On the Town has a 96 percent fresh rating on Rotten Tomatoes and Leonard Maltin calls it a "terrific entertainment" that's "innovatively shot all over the City" in a 4 star review for his Classic Movie Guide. Critics in 1949 praised the film. The New York Times reviewer Bosley Crowther noticed the changes from the Broadway musical, and, while he lamented the loss of a few numbers, he thoroughly enjoyed the movie, especially the dance numbers and location shooting. He praised Kelly, Donen, and Freed for engineering "sizzling momentum by the smart employment of cinema techniques." The Variety reviewer praised the movie's fast-paced fun, writing that "[t]he pep, enthusiasm, and fun the makers of On the Town had in putting it together comes through to the audience and gives the picture its biggest asset." The Bottom Line: MGM's tagline says it all: Kelly, Donen, and company "paint the town with joy" with one of the most exuberant and colorful musicals of old Hollywood's golden age. Availability: On the Town will air at 12:30 a.m. Aug. 5 on TCM. It is also available on DVD, and video on demand. Next week, I'll continue the August theme of Summer Under the Stars with Aug. 12 actor John Wayne in The Quiet Man (1952).